It’s no secret that many regions throughout the United States pursue biotech cluster development in their communities. The biopharmaceutical sector has a significant economic impact, providing high returns while contributing to the development of vibrant regions across the country, according to a 2011 report by Battelle Technology Partnership Practice. Successful hotspots such as San Francisco and San Diego or Boston/Cambridge feature similar strengths: collaborative environments, academic and research institutions, access to VC funding, and specialized talent. Another potential hub for biopharma can be found in New Jersey, or what BioNJ considers to be “the medicine chest of the world,” which is home to 14 of the 20 largest pharmaceutical companies including Bristol-Myers Squibb, Johnson & Johnson, and Novo Nordisk. But New Jersey aims to be more than a pharma phenomenon. “We like to think of New Jersey as a brain belt between two powerhouse locations: New York for financial support and Washington for regulatory approval,” said James Shannon, chief marketing officer of Choose New Jersey, an organization that serves as the starting point for all initiatives, policies, and efforts related to growing the Garden State’s economy and jobs. Recently modified incentives offered by the state should appeal to biotech startups. In September, Governor Chris Christie signed the Economic Opportunity Act, which reduced the number of jobs a company was required to add in order to qualify for tax breaks. As few as 10 full-time jobs created for technology start-ups could qualify a company for tax credits that are transferrable and can be resold in the open market, the benefit of which can be shared with its investors. Biopharma establishments in New Jersey also have a robust talent pool to recruit from. The 63 colleges and universities located in the state produce 22,000 life sciences graduates annually and include renowned higher education institutions such as Princeton, Rutgers, and the New Jersey Institute of Technology. Becton, Dickinson and Company (BD) has been incorporated in New Jersey since 1906. It has more than 50 locations around the world, but the company’s current global headquarters are located in Franklin Lakes. Looking back on its growth from a small family firm to a multinational corporation, Gary Cohen, executive vice president, said the company is proud of its deep roots in the state. Recently, its subsidiary BD Rx received FDA approval for the third in its series of BD Simplist™ ready-to-administer line of prefilled syringes containing generic injectables. The ondanestron injection for nausea and vomiting joined BD’s prefilled injectable line of products, metoclopramide and diphenhydramine hydrochloride. BD Simplist was designed to reduce the risk of error and improve safety by reducing the number of steps in the vial or syringe injection sequence, according to the company. Another New Jersey partisan is NPS Pharmaceuticals, which sold its former Salt Lake City facility and Toronto-based research laboratories in 2007 and consolidated all activities to the company’s current headquarters in Bedminster as part of an effort to restructure operations and strengthen its financial position. “Biotech is associated with the entrepreneurial spirit,” said Francois Nader, M.D., president and CEO, while describing NPS’ commitment to fostering an environment that celebrates success. NPS focuses on delivering therapies for rare gastrointestinal and endocrine disorders. Its lead product, Gattex®, is marketed in the United States as a treatment for short bowel syndrome. Also in the company’s pipeline is NATPARA™, which, if approved, would be a parathyroid hormone replacement therapy for hyperparathyroidism. Fresh to New Jersey is Botox® creator Allergan, which cut the ribbon on its new R&D site in Bridgewater last year. Upon the facility’s opening, the company’s president and CEO David E.I. Pyott said Allergan planned to spend more than $1 billion on R&D in 2013 and is committed to creating several hundred jobs over the next 10 years. “Our New Jersey clinical development site will allow us to benefit from the expertise of the many talented R&D professionals that reside in this state and, most importantly, bring novel medical therapies to patients across the world,” Pyott stated. Allergan is currently focused on five specialty areas: eye care, neurosciences, dermatology, urology, and cosmetics. The company is working on other indications for Botox, which received FDA approval and U.K. authorization this year for the treatment of overactive bladder in adults who are intolerant of or not adequately managed with anticholinergic medication. PTC Therapeutics, residing in South Plainfield, is developing therapeutics for orphan and ultra-orphan disorders, such as Duchenne muscular dystrophy (DMD). The company directs its discovery efforts toward the development of orally administered, small molecule drugs that target post-transcriptional control processes. Ataluren, the firm’s lead investigational candidate, is in Phase III clinical development for the treatment of DMD and cystic fibrosis that arise from a nonsense mutation. The European Medicines Agency and the FDA have both designated Ataluren as an orphan drug, according to PTC. Of Celgene’s 5,000 global employees, 2,000 are working in its Summit-based research facility, which focuses on developing treatments for cancer and inflammatory diseases. The company said investigational compounds are being studied for patients with hematological and solid tumor cancers, including multiple myeloma, myelodysplastic syndromes, chronic lymphocyte leukemia, non-Hodgkin’s lymphoma, myelofibrosis, small cell lung cancer, and prostate cancer. The close proximity to other key areas in the United States, a preponderance of big pharma companies to partner with, and higher education and research institutions make New Jersey fertile ground for biopharma, which is already starting to bloom in the Garden State. BD Biosciences, a business segment of Becton Dickinson with facilities in Franklin Lakes, NJ, provides instruments, reagents, cell cultureware, and services. 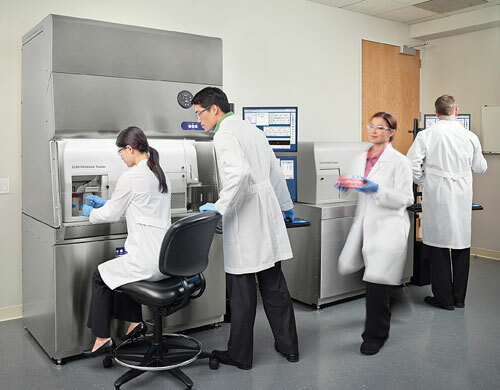 Its FACSAria Fusion is a cell sorter that is available with or without a biosafety cabinet.